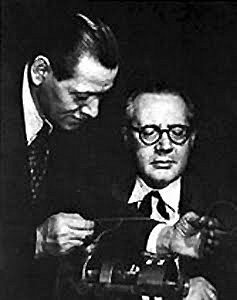 Andrés Segovia attempted to acquire the creative energies of the Italian composer Mario Castelnuovo-Tedesco, whom he had met and befriended in Venice in 1932. 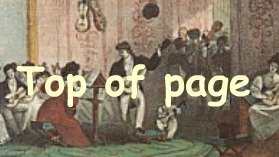 The Italian did not play the instrument and thus Segovia gave him guitar compositions (Ponce's Folias variations and Sor's Mozart Variations) from which he could study the guitar's idiosyncrasies. A large number of guitar works, many of them dedicated to Segovia followed, including the first guitar concerto of the 20th century Concerto op.99 which Segovia premiered in Uruguay in 1939. Segovia married a second time in 1935, this time to the pianist Paquita Madriguera, who also made some piano roll recordings. The Maestro vacated Europe, no doubt to avoid the looming cloads of war, and settled in Montevideo, Uruguay. He did numerous tours throughout South America in the thirties and early forties. 1935 saw the first performance of Segovia's transcription of the Bach masterpiece Chaconne from the Partita II in d minor (originally for violin solo BWV 1004). The end of World War II saw Segovia performing regular concert tours of Europe and the U.S. , he continued to these tours for the next three decades. 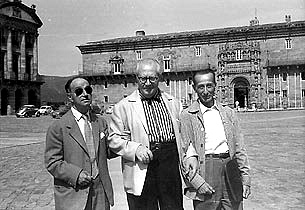 Fellow Spaniard Joaquín Rodrigo dedicated his Fantasía para un gentilhombre (Fantasy for a Gentleman) to Segovia in 1954. He was awarded the 1958 Grammy for 'Best Classical Performance, Instrumentalist' for his recording Segovia Golden Jubilee. In 1962 he married his third wife Emilia Magdalena del Corral Sancho, they had one son, Carlos-Andrés de Segovia y del Corral. John W. Duarte dedicated his English Suite Op.31 to the newly weds, Segovia told the composer "You will be astonished at the success it will have". King Juan Carlos I ennobled the guitarist on 24 June 1981 in recognition of his contributions to music and the arts. Thus segovia earned the hereditary title Marqués de Salobreña (English: Marquis of Salobreña). He continued performing into his old age and resided in the Costa del Sol in semi-retirement. His life and work was documented in two films, they are available today on a DVD called Andrés Segovia — in Portrait. Reveries was his final LP recording and was recorded in Madrid in June 1977. A 1984 production saw him featured in a thirteen part series broadcast on National Public Radio, entitled Segovia!. Andrés Segovia died in Madrid of a heart attack at the age of 94. He is buried at Casa Museo de Linares, in Andalusia. Segovia's plucking technique involved the plucking of strings with a combination of his fingernails and fingertips. The Maestro Francisco Tárrega had played with fingertips only in the later part of his career and hence many of his students such as Emilio Pujol did the same. Segovia shared this technique with Miguel Llobet who had taught him several of his transcriptions of Granados' piano works. The sonic result of this technique was a sharper sound than many of Segovia's contemporaries, it also allowed for a wider range of timbres than those achieved with fingertips or nails alone. Among classical guitarists there has historically been much debate about which is the superior technique, with the vast majority using Segovia's choice in the modern era. For centuries guitar strings were made from catgut (made from the intestines of animals such as sheep or goat), in the 1940's Segovia collaborated with Albert Augustine and Du Pont to produce the first nylon guitar strings. Contemporary works including concertos and sonatas that had been written specifically for Segovia by composers that he had forged working relationships with. Prominant among these were the Spaniards Federico Moreno Torroba, Federico Mompou, and Joaquín Rodrigo; the Mexican composer Manuel Ponce; the Italian composer Mario Castelnuovo-Tedesco; and the great Brazilian composer Heitor Villa-Lobos. Transcriptions, many by himself, of classical works written for instruments such as the lute, piano, violin by prominant composers like Johann Sebastian Bach, Isaac Albéniz, and Enrique Granados. The last class of works is made of traditional classical guitar works written by composers stretching across four centuries, some of which had been revived or adapted for the modern instrument. Composers from this period include the 16th century Luis de Narvaez, the 18th century Robert de Visee and the 19th century Fernando Sor. Teaching was a vital ingredient to Segovia's mission of propogating the guitar and he gave masterclasses throughout his career. The most famous of these were those held at Música en Compostela in the northern Spanish city of Santiago de Compostela. This annual summer course in music performance and composition was initiated by Segovia and the diplomat José Miguel Ruiz Morales in 1958. He also taught at the Accademia Musicale Chigiana in Siena, Italy where he was aided by Alirio Diaz. Today Andrés Segovia is widely regarded as having been a catalytic proponent in granting respectability to the guitar as a serious concert instrument capable of evocativeness and depth of interpretation. 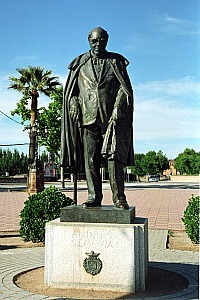 A museum Fundación Andrés Segovia was established in his brithplace in May 1995, and a bronze statue, created by Julio López Hernández, was unveiled in the maestro's honour on 25 May 1984. 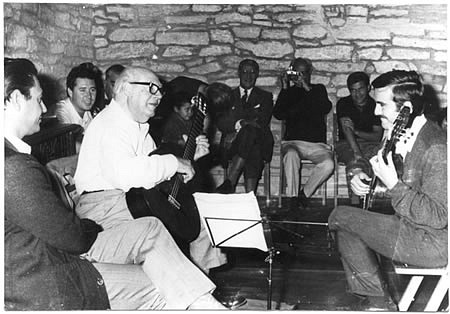 Segovia's influence on the next generation of classical guitarists cannot be overstated, maestros such as Christopher Parkening, John Williams, Julian Bream, and Oscar Ghiglia all built their careers from where Segovia left off. All guitarists owe a devoted deference to this maestro who deservedly takes his place amongst the Greats who served the beloved instrument so well over the past many centuries.